Original mettamusic for the heart and soul. Through highly interactive, extremely unique, original music sets, Stratusphere aims to raise the vibration of the listener through doorways and walls of sound, earthy tones, grounding beats, and deep bass. Striving to share emotion and healing energy through sound, Stratosphere takes the listener on a journey deep beyond this third dimension drawing inspiration from Source, stars, spirits , the energy of the night sky, being surrounded by trees and nature, and the infinite mind. The goal is to co create portals while opening and connecting hearts, while giving an offering to the land, its ancestral spirits, and the Mother across all the sacred lands. 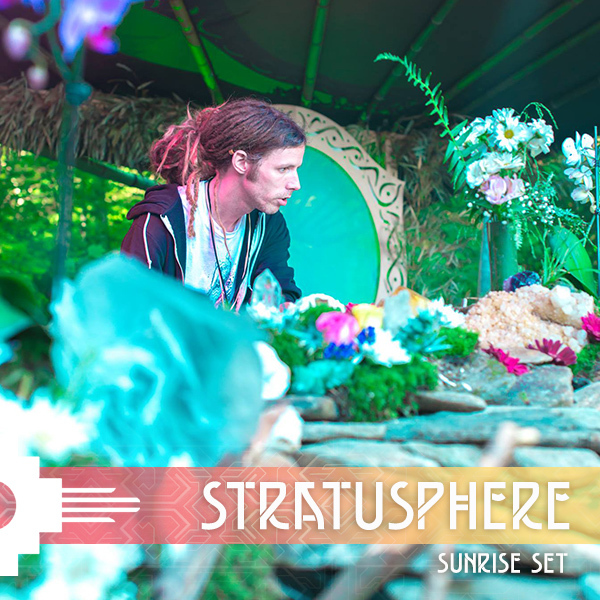 Stratusphere has humbly shared the stage with Entheogenic, Random Rab, Bluetech, Desert Dwellers, Kayla Scintilla, Pathwey, Sixis, bioLuMigen, Kaminanda, Living Light, SaQi,Govinda, Aligning Minds, Nominus, Pericles, Futexture, Higher Learning, Akara, Ilya Goldberg (from Emancipator), Kynara, and many more, and has played at numerous festivals, intentional gatherings, and portal openings across the country and internationally.